Today I write this post in honor of my beautiful friend, Nat-r-Be. Nature is in constant communication with us.Whether we believe it to be true or completely understand this fact, it is true. Communicating with Nature can be no different from going to a foreign land without knowing the language. At first we may have some trouble speaking and hearing each other, but eventually with practice, and with an open heart, we absolutely can and will know when Nature has something to share with us. The way I find it easy to communicate with Nature is to connect each element, animal, insect and, or, any aspect of itself to a message. There are specific spiritual meanings, signs if you will, that when they cross the paths of our lives they are trying to give us confirmation to what is going on in our lives. The spiritual meaning of an owl communicates to us through it’s wisdom, that You are being called upon to open your eyes, ears and mind to the truth of a situation. To listen to the wisdom deep in your heart and soul. That still small voice is trying to reach you in some way. To assist you or help you in a current challenge you may be facing. Some people believe that owls bring fortune for making wise choices. To illustrate, you may have abilities to know things that others do not know. It may be likely you have very strong intuitive abilities that can be fine-tuned. Further, you may be strong-willed person, and/or have a protective side to you. So with that said, I will end this post with a little request. Embrace Nature. They are, it is, after all, our extended family. A reflection of us all. ← Grow your own Garden of Eden! Awww…thank you Jules. I love you! A owl hit my car today on my side door…it freaked me out. This has never happened to me…I am looking for answers. Can you help? I found your message very fulfilling. It resonated with me as truth. Thank you for your efforts to bring your message to the world. Peace! Awomb! A huge horn-tuffed owl recently came to me on my balcony and would not leave for a long time. What does this mean? This happened about 2 months ago and I cannot stop thinking about it. I bought one at a market to put on my bookshelf and its so funny to walk into a strange shop and I laugh ..owls hi there..sometimes I get the buzzes down my back when I talk about them to the shop assistant. Are they my guides giving me directions or to that nature? We sometimes have a tawny mouth one visit mainly in winter which it is now. I was sitting on my porch and an Owl came right up and sat with me. I feel so honored and it happened on Jan. 1, 2014. I talked to him and he even let me take his picture. He stayed for about 20 minutes. I am still in awe! I wish I could send the picture. This was a marvelous post! I deeply enjoyed it and had to share on FaceBook. Is there one on the sea turtle? I have believe he is my totem. Thank you Dorothy. I may write with the sea turtle soon. 🙂 Tell me, what is it that makes resonate so much with the sea turtle? Also ,the place where the owl had come and sat for so long,I have a bogan villa plant there,Abd on it just a few days back I had put a stained glass artifact of an owl,painted by me, Abd that very place the owl came abd sat,…… Surprising!! I experienced a special encounter with a small owl a couple of weeks ago. It was Sunday evening around 7:00 pm and I had just left my house when I saw the owl on the edge of the opposite side of the road. I was intrigued by my siting as the owl is my favorite bird. I turned my car around and stopped about 10 feet in front of it with my headlights shinning brightly on it. The owl just sat there and even turned it’s head and starred into my headlights. It’s beautiful eyes appeared to be green. I had my iPhone handy and I got out of the car and approached the bird for a picture. The lighting of my car provided a great shot and the owl actually seemed to pose for me as it turned it’s head to face me and I took a great picture. I had time to take another but, I thought there was no need as I glanced at the picture and it appeared to be a perfect shot. 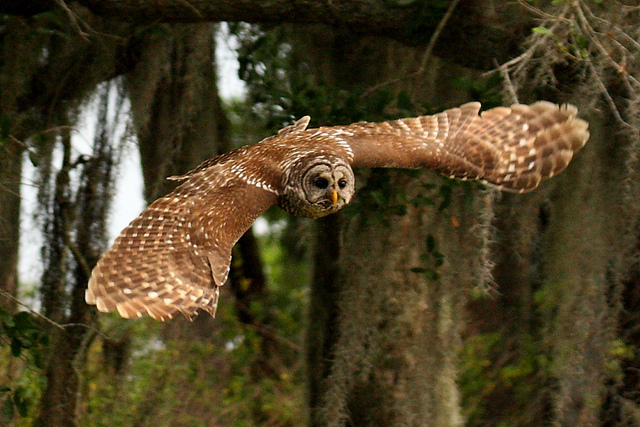 I then enjoyed my encounter as the owl continued to look at me until I took a step toward it and it flew away. I then got back into my car and reviewed my picture. At first, I was upset as the image was only a vapor or smoke type image of the owl. It is the strangest thing as you can see completely through the image and even see the payment and background which is very clear. You can see that there is a ghost looking form and I know it is the owl but it isn’t the picture I took. Everyone I share the photo with, has a different reaction and idea or explanation, but, all say it appears to be a spirit. I am seeing it as a positive experience and choose to believe that owl had some reason for allowing me to spend the time engaging it. After reading your spiritual meaning before this posting, I find your explanation positive and I appreciate your insight. I have the picture if anyone would like to see it. I am virgo. Full moon in virgo last night. An owl has been perching on our roof the last few nights. Last night it was here again and VERY loud on our roof ! I know it is a strong message for me to begin a new journey with my spiritual knowledge. I have always felt drawn to these birds. But it was hooting and singing SO loud last night. And under that beautiful full moon ! It was awesome. Opinions please ? I live on an acreage and have never noticed or heard an owl before. Last night I heard a loud thud on my front door. I turned on the outside lights and there was an owl sitting on my front step. It starred directly at me for a few moments, spread its large wings and flew off. I’ll never forget those eyes, only a few feet from me. It’s like it was trying to relay a message to me or something. I’m confused why it did not see my house at night given its keen night vision. I miss my great horned owl friend. We talked everyday for months. I only saw him once, but he started the conversations when I’d go out early in the morning to have coffee on the porch. I wished so much to see him, and he finally came and stood under the the security light as if he were reading my mind. He was really tall. Hi. I saw an owl fly past me outside as I was standing there. About an hour later , I was sitting out side again and the owl seemed to be back again sitting in the tree, and seemed to be chatting away, but I walked inside as very late and I’m very tired, I’m having a few problems with my boyfriend for a while now and I have no friends or family where I live and spend most days crying because of my boyfriend. I really want to get back home to my family. What could this mean with the owl visiting? I was diagnosed with stage 3 cancer. Dealing. But, all of a sudden I am seeing owls everywhere. Even stuffed owl animals. It was happening so much, I could not shrug it off. I thought to search on owls, because it kept seeming that it meant something. I am not ‘into’ these sorts of things. Imagine my surprise to find out what owls mean. Don’t worry. I am not afraid to die. Just thought this might be of value to someone. Thought it was time to update. It has been 9 months. I had a CT scan 2 weeks ago & no answer, no answer…making me crazy, but too afraid to ask. I had a total larengectomy May 9th. Was in hospital until june 28th. I can no longer speak or smell. That has been so tough, the surgery did not go well. A BAD infection & had to undergo surgery again after 3 days. Needless to say, it has been a long & slow rehab. Getting used to being non-verbal, but I REALLY miss not being able to smell. However, since they decided I WAS recovering, they wantred a CT scan to address lung issues from a precious PET scan (tthat I was unaware of. I HATE it when people withhold info from me.) Turns out I have to do another biopsy, lung. And last time I had a biopsy, I came to, 2 days later with a larengectomy without my consent. So I am scared to death & tring to stop crying & make my plans. I want to thank all of you for your support. I VERY much thank you. On my last evening with my six year old grandson, a great big owl flew over and landed on our garage roof. He sat for a moment to just gaze at us – this was an amazing moment shared with one another since I was leaving to relocate for employment and to begin a “new chapter in my life”. We share a great bond between us and it was just an awesome sign of greater things to come! Ok so I like what you had to say and feel a little more at peace. I lived in Reno NV for 2 years and my last 6 months of living there we had an owl perched outside our bedroom window on the house. We didn’t see it every night but at least 3 or 4 times a week. He just sits there and hoots. Then we moved to NM and about 2 weeks after we moved in. Same thing this owl perches outside our bed room window and we see it 3 or 4 times a week. And this has been going on for 7 months now. I swear it’s the same owl. I was sitting on the couch with my dog, drinking a glass I found wine having one last smoke before bed..it was around 2:00am. And something hit my front door.. knuckles (my dog) started barking of course.. curious about what it could be.. I forgot to mention I live in a cabin up in the mountains in irwin, idaho.. I opened the door and an owl was laid wings out.. on my welcome matt.. I’ll attach a video and some photos so you can appreciate how amazing it was..
woow. I aunestly have to say i am so relieved knowing that what i just read regarding the owl singing..It brought tears to my eyes and soothed in my heart.That it’s all me. even though i haven’t had a steady peacefull life, I still believe things happen for a reason. It’s so good to know we are blessed with mother nature. What a beautiful feeling that brings to my life. 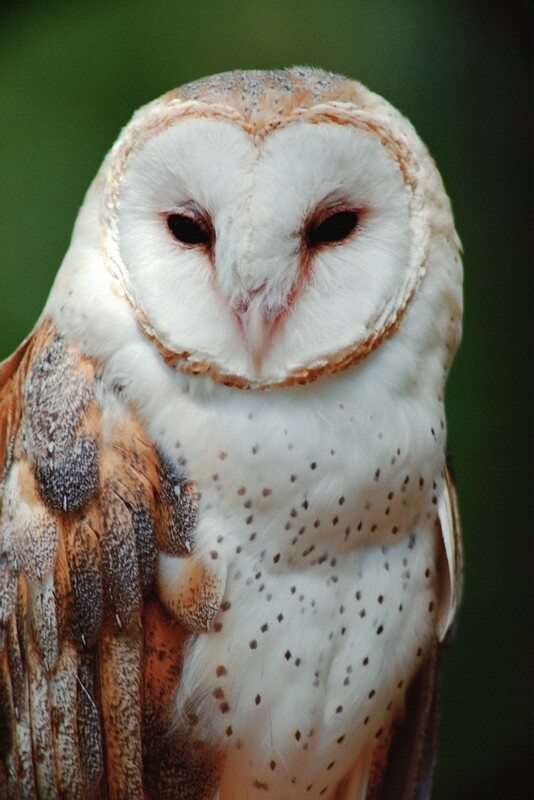 I have a barn owl that sits on my neighbours house and hoots, everytime this owl has been on the roof something bad happens, is it a bad omen, I am terrified to look at it in case something bad happens to me. A large owl graced my father with its presence, it was perched on his back gate, it was looking at him so intently, my father passed away a few weeks later and it has been on mums mind ever since, it was a large brown owl , we are in a town centre but there is a canal atvthe back of my parents bungalow & there are alot of wildlife around, but this was an unusual event!! In this time of the year in my neighborhood we can see one small brown owl. It happens in recent few years, we also can hear her loud voice, and it seems all around is ok. There are many houses pretty crowded, and today we realized that small owl brought 2 newborns exactly on the hole below my attic’s planks. Hope this will bring some good events. No driving home from the store at 3 a.m. this morning I had a beautiful white owl with wingspan about 7 feet fly right in front of me and then right next to my side of the truck only about 10 to 15 feet away for about 3 to 5 seconds and then it turned into the neighborhood that I was going in This was pretty awesome and I totally was in a state of awwww, like time stopped. I was wondering if anybody had any idea if this event has meaning or significance that I should be aware of. That is so cool! I just love nature. I love every aspect of it. I feel more at home in the woods than I do my own house. I had a big beautiful barn owl just come and sat himself down right in front of my door watching me as if he were trying to tell me something.